And the first thing I want to say about them that’s important is really hunger strikes are a last resort. I remember when I was back teaching and working on the Guantanamo one, which was the Haitian cases, the HIV people left at Guantanamo Bay, kept there by the United States. And after we’d lost all the lawsuits, the Haitians said, what can we do but go on a hunger strike? You hate to see your clients do it. It’s painful. Any of us who have fasted for one day or two days or three days–I know what it’s like. So it’s really a last resort. It’s when all else has failed, when the powers-that-be failed, when the litigation we do fails, when even a mass movement to some extent has failed, and prisoners and detainees and others say, we’re going to take our fate into our own hands, we’re going to decide our fate, and we’re going to do what’s necessary to change what’s going on; we’re going to become the actors in this drama that is unfolding. And going back before that, and in my memory, in the early ’80s, there were the hunger strikes that took place by people from the Provisional IRA in Northern Ireland in British jails. The one most people have heard of is of course Bobby Sands. Bobby Sands was a prisoner of the British. He went on a hunger strike, and he died, actually, from that hunger strike. He died I think in 1981. Let’s jump forward to today. First, Pelican Bay. Pelican Bay, as I said, has some 29,000 people both at Pelican Bay and in prisons throughout California on hunger strike. There’s a history to that at Pelican Bay. 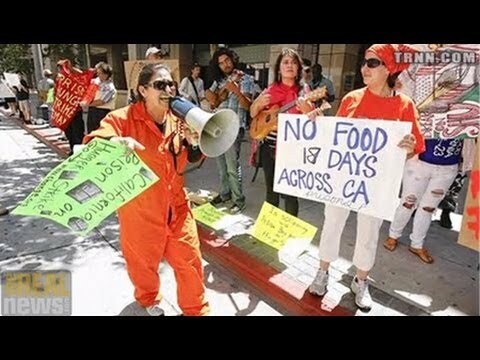 In 2011, some 6,000 people at Pelican Bay in prisons in California went on a hunger strike. California agreed to make certain changes. The main change–and this is really important to understand why people are on hunger strike in California–is to solitary confinement. When you hear the statistic, you just can’t believe it. People have been in solitary confinement in Pelican Bay from 11 to 28 years. That’s right, 11 to 28 years. And they have no real way of getting out. And solitary confinement past something like 15 days is to be considered–is considered by most authorities and legal authorities to be cruel and unusual treatment, and here it is going on in hundreds of cases for 11 to 28 years. The state of California promised to remedy that three years ago after the last hunger strike or two years ago. They didn’t do anything. And just this week the hunger strikes again began. The demands are to end that solitary confinement contrary to the U.S. Constitution as well as international law. Let’s fast–not fast-forward. Let’s just go to Guantanamo, where a hunger strike is continuing right now. Some 100 people are on a hunger strike at Guantanamo. Forty of them are being force fed. Their demands are, one, to finally get them out of Guantanamo. This has only been 11 years that they’ve been at Guantanamo. In some cases many of those people have been cleared for release. They remain there. And what’s most interesting, the most interesting development–of course, they’re being force fed contrary to law. The most interesting development was a lawsuit that a judge ruled on this week in the case of one of the people at Guantanamo. It was someone who had been cleared for release who’s on a hunger strike who’s being force fed. His lawyers went into court and said, you’ve got to stop the force-feeding, it’s illegal, it’s contrary to medical ethics. The judge said, I can’t do that, I don’t have any jurisdiction to do it, there’s just no way the court can do it. So the first thing the court said: there’s no jurisdiction. And the reason the court said that is because our Congress, in it’s great wisdom, passed a law stripping all federal courts of dealing with any conditions at Guantanamo. So the judge had no jurisdiction. She could have ended the case right there, but she went on in two amazing respects, and it’s something–it’s a short opinion, but I’m going to read you a little bit of it. But everybody ought to look at. The first thing she said: she essentially agreed that there’s a consensus in medical and legal opinion that force-feeding violates article 7–article 7 of the International Covenant on Civil and Political Rights that prohibits torture, cruel, and inhumane treatment. In other words, forced feeding–and, of course, the way they do it is you sit in a restrained chair like this, your head’s restrained, a tube is put down your nostril into your stomach. It’s a form of torture itself. And so what she’s saying the law is clear that the International Covenant on Civil and Political Rights is violated by force-feeding. And then she cited a letter that the American Medical Association wrote to the U.S. Department of Defense, secretary of defense. And here’s what it said. The core ethical values of the medical profession find that force-feeding is a painful, humiliating, and degrading process, so it can’t be done. So the U.S. is violating the law not just in keeping people at Guantanamo, but in forcing them to be fed. So she found first she couldn’t hear the case, but then she went on to say it’s essentially illegal and unethical. And then–and I think the greatest slap we’ve seen from a federal judge in recent times to a sitting president was this. She says, even though the court doesn’t–does–the court must dismiss this case, and she obviously as an individual judge felt very badly in doing so. She says this important thing about President Obama. There is an individual, she says, who does have the authority to address the issue. In a speech on May 23, 2013–it was the big Obama national security speech–she says President Obama stated, quote, look at the current situation where we are force-feeding detainees who are holding a hunger strike. Is that who we are? Is that something that our founders foresaw? Is that the America we want to leave to our children? Our sense of justice is stronger than that. Then she goes on to say, after quoting the speech, she then says the president of the United States is the commander-in-chief of the military. And she quotes the Constitution. And then she says–she ends her opinion. It seems to follow therefore that the president as commander-in-chief has the authority and the power to directly address the issue of the force-feeding of the detainees at Guantanamo. She places the blame squarely where it belongs, on the shoulders of Obama, who himself has condemned the force-feeding yet refuses to do anything about the force-feeding or releasing the Guantanamo detainees. So we have California, we have Guantanamo, and then, as when I opened this segment, we have Palestinians in Israeli jails who are on hunger strike. And there’s, you know, at least two dozen of them, very long hunger strikes. Some have come very close to death and have been released as a result because Israel apparently, from what I read and hear, does not have a policy of force-feeding. And so what does that mean in the Israeli context? What it means is that the Israelis–what I understand: the attorney general’s office in Israel is currently examining the legality of a government bill that would enable prison authorities to force-feed hunger-striking prisoners. And they’re doing that because in the past they faced mounting challenges, this article said, to the fact that Palestinian security detainees, in other words, administrative detainees who are held in prison without any charges, are getting early release because the Israelis are so afraid of them dying in prisons. So hunger strikes are effective. And as long as the law is followed, which is to say you can’t force-feed them, they actually can result in change and release of some people. So what’s Israel considering? Complying with the U.S. law, the U.S. law, the U.S. nonlaw. And I’ll end on this little note. The Israeli–the Palestinian prisoners in Israeli jails have issued a strong solidarity statement with the Pelican Bay prisoners, trying to make us understand that people in this situation, the oppressed, those made and weakened by the state, those abused by the state, can begin to take control in their own hands and their solidarity across these lines from Pelican Bay to Guantanamo to Israeli prisons. I’ll end on this remarkable statement that I read in the paper that doctors from Israel are coming to the United States because the United States claims it needs help in dealing with hunger strikes, that they’re having trouble figuring out what to do, so they’re going to the Israeli doctors, no less. Now, in some way I don’t believe that headline, because if you accept what I just said, which the Israelis do not force-feed but the U.S. does, in fact what may be happening is the Israelis are coming here to learn how to force-feed prisoners so they don’t have a problem in dealing with the force-feeding of their prisoners. In the end what we’re seeing is people who are the oppressed taking their lives into their own hands, becoming actors in their own dramas. And basically that is the way–sadly, but that is the way that they will make change, whether it’s at Pelican Bay, Guantanamo, or in Israeli prisons where Palestine–where Palestinians are in prison.